Lately I’ve been updating and republishing a lot of old recipes. Mostly it’s because there’s 8-ish years of content on this blog, and much of it is old and crappy. Crappy photos, endless, meaningless drivel about my life, and recipes that may or may not have been properly tested before they were posted. It’s a hell of a lot of work updating all these recipes, but each and every one that gets a facelift feels so good! 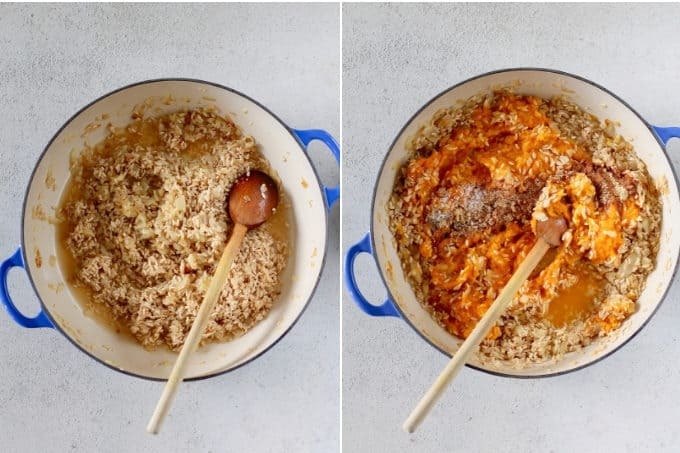 And then there are the times I catch things in the recipe testing that make me cringe – like this Baked Pumpkin Risotto, which I originally posted in 2014, and while it was totally delicious, called for the extra step of par-cooking the rice before it got added into the risotto. Whyyyyyyyyy would we want to dirty up an extra pot when we don’t have to?! So I tested and re-tested the recipe without par-cooking the rice, and was pleased to discover that with a little extra liquid and a little extra time, this baked risotto recipe comes together like a dandy, all in one pot. Phew! 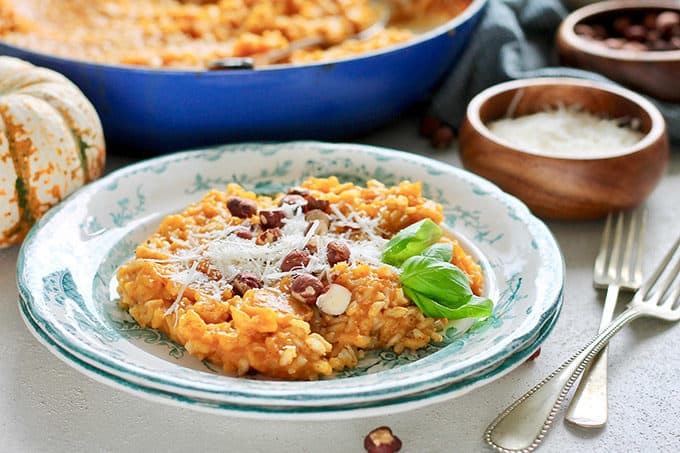 This means that healthy and delicious creamy vegan baked pumpkin risotto can be yours with minimal hands-on time, minimal cleanup, and maximum cozy pumpkin spice flavour. Win-win! 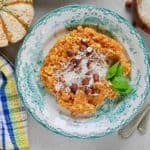 What do I need to make this baked risotto recipe? Short-grain brown rice. Because we’re healthy and shizz. Pumpkin purée. Canned is totally acceptable, but you can also use homemade. Onions. These babies are getting deeply caramelized for super rich flavour. Spices. To spice up your life! White wine or vermouth. You decide! Vegetable broth. Not in the above photo, but I assure you it’s necessary! How do I make this oven baked risotto? Let’s start by chopping up the onions and garlic. They’re going to get cozy with some olive oil in a deep oven-proof skillet until they’re nice and browned. See all that brown stuff on the bottom of the pan? 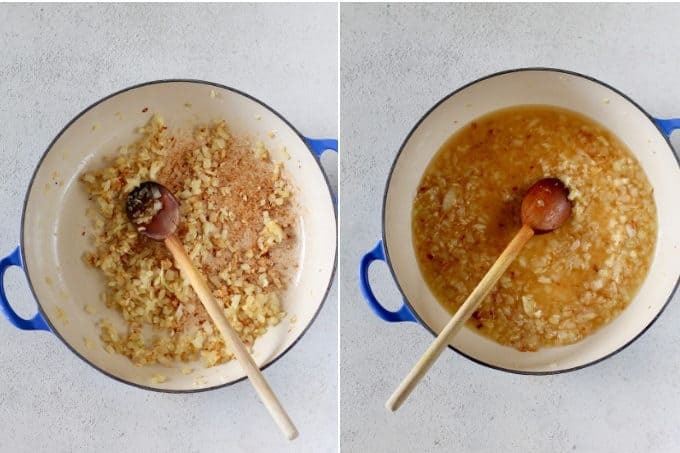 We’re going to deglaze the pan, which is a fancy word for adding a bit of liquid (in this case white wine or vermouth) which will lift up all that nice caramelized flavour and make sure it gets incorporated into our baked risotto. Once the liquid has mostly evaporated, we’re going to stir in the brown rice and let it soak up the last little bit. Then we’re going in with the pumpkin purée and spices. Aaaaaaand we’re going to add the vegetable broth. I don’t have photos of this stage because carrying a hot skillet full of super hot liquid from my living room (where I take my photos) to my kitchen (where the actual cooking happens) is a very bad idea. It might seem like a LOT of broth, but I assure you it’s all gonna get soaked up into the risotto as it bakes. Now it’s going to do a good stint in the oven. We’re going for a little over and hour with a lid or foil covering the dish, and then we’ll check the rice to see whether it’s done and add a little extra liquid and a little extra time if necessary. 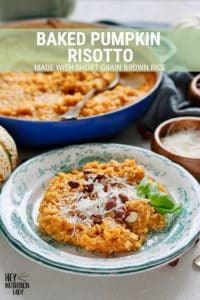 This baked risotto gets a little rest and then a good stir when it comes out of the oven, and then you’ve got creamy, dreamy pumpkin risotto ready to serve. Do I have to use short-grain brown rice? That is how I’ve tested this recipe and how I believe it turns out best. If you want to use another kind of rice you may have to adjust the amount of liquid and / or the cooking time. What’s with the vermouth? I usually only have white wine around the house in the summer, but there’s almost always a bottle of white vermouth in my liquor cabinet. Since vermouth is fortified wine, I find it works interchangeably with wine in most recipes. I don’t have an oven-proof skillet. No problem! You can use a deeper oven-proof pot like a Dutch oven, or if you don’t have one of those, simply grease a casserole dish and transfer the risotto into there before baking. My oven-proof dish doesn’t have a lid. This is why Jesus invented tin foil. A tight layer over the top of your dish will do just fine. 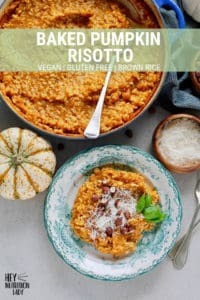 Is this baked risotto recipe vegan? You bet! I like to top mine with shredded parm because I’m not vegan, but aside from that it’s plant-based AF. 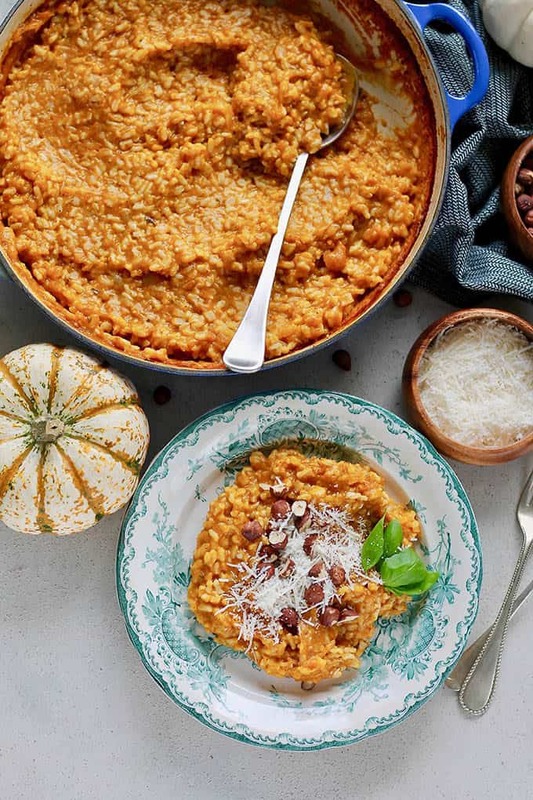 Is this pumpkin risotto recipe gluten-free? Yes ma’am. Unless you’ve discovered some new gluten-containing rice varietal that I’m not aware of. I baked my risotto for the prescribed amount of time and the rice is still crunchy. That happens sometimes. Just stir in a little bit of liquid – a cup or so of vegetable broth or water – cover, and bake for another 15-ish minutes. When I take the risotto out of the oven it looks super dry. Fear not! Often times a dry-looking layer forms on the top, but when you give it a stir you’ll reveal the creamy goodness beneath. If not, feel free to stir in a bit of extra vegetable broth – it’ll absorb into the rice as it rests. When I take the risotto out of the oven it seems quite liquidy even though the rice is cooked. Just give it a stir and let the risotto stand for 5-10 minutes. That liquid should soak right up! Hey Nutrition Lady, what’s the deal with brown rice? Brown rice is a source of dietary fiber, manganese, selenium, magnesium, and tryptophan. Did you know that the process of converting brown rice to white rice destroys 60 – 80% of the vitamins and minerals, and all of the dietary fiber and essential fatty acids? Think of white rice like cake, it’s a special occasion food and should be eaten in moderation. Brown rice, on the other hand, is a whole food with a myriad of health benefits from colon health to cholesterol lowering. You can have your cake and eat it too! 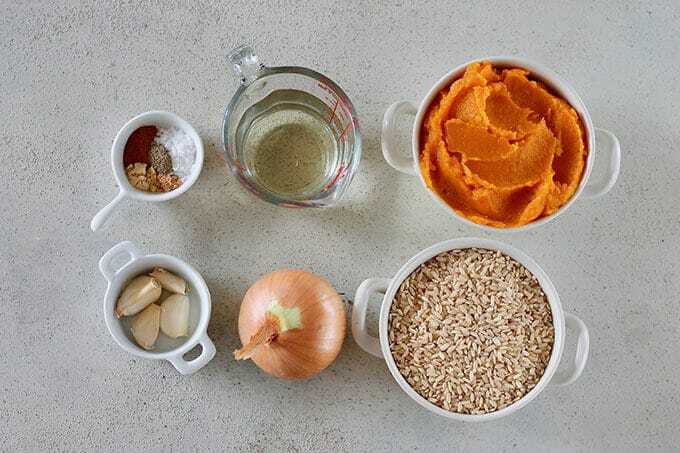 This Baked Pumpkin Risotto is made with brown rice, making it a healthier option than standard risotto. It's rich and creamy in spite of being vegan and dairy free, and since it's baked there's almost no stirring required. Heat a 30cm / 12 inch cast-iron casserole dish over medium-high heat. Add the olive oil, and then the diced onion. Cook the onion, stirring occasionally, until it has softened and is beginning to turn golden brown. Add the garlic, and sauté for another few minutes until the garlic is slightly browned as well. Add the vermouth to deglaze the pan, stirring to lift up any browned bits that are stuck to the pan, and then remove from the heat. Add the rice to the dish with the onions. Stir in pumpkin puree, ginger, cinnamon, nutmeg, salt, and pepper. Stir the mixture to combine well, and then spread it out in an even layer in the casserole dish. Pour the hot broth over top of the rice mixture, and gently stir. There should be a good layer of liquid over the top of the rice. Transfer carefully to the oven, as your dish may be very full. (Alternatively, I like to put the casserole dish into the oven and then pour the broth over top). Bake, covered, for 60-75 minutes. Test the rice and see whether it's cooked through. If needed, add up to 1 cup of extra liquid and bake for an additional 15 minutes (I like to check this at around the 65 minute mark). When you remove the dish from the oven there may still be a layer of liquid sitting on top. This will continue to absorb as it cools. Allow the risotto to stand uncovered for 10 minutes, and then, give it a good stir. The rice should be fully cooked, and the risotto quite creamy. Serve hot with lots of freshly grated Parmesan or nutritional yeast to keep it vegan. Do I have to use short-grain brown rice? That is how I've tested this recipe and how I believe it turns out best. If you want to use another kind of rice you may have to adjust the amount of liquid and / or the cooking time. What's with the vermouth? I usually only have white wine around the house in the summer, but there's almost always a bottle of white vermouth in my liquor cabinet. Since vermouth is fortified wine, I find it works interchangeably with wine in most recipes. I don't have an oven-proof skillet. No problem! You can use a deeper oven-proof pot like a Dutch oven, or if you don't have one of those, simply grease a casserole dish and transfer the risotto into there before baking. My oven-proof dish doesn't have a lid. A tight layer over the top of your dish will do just fine. 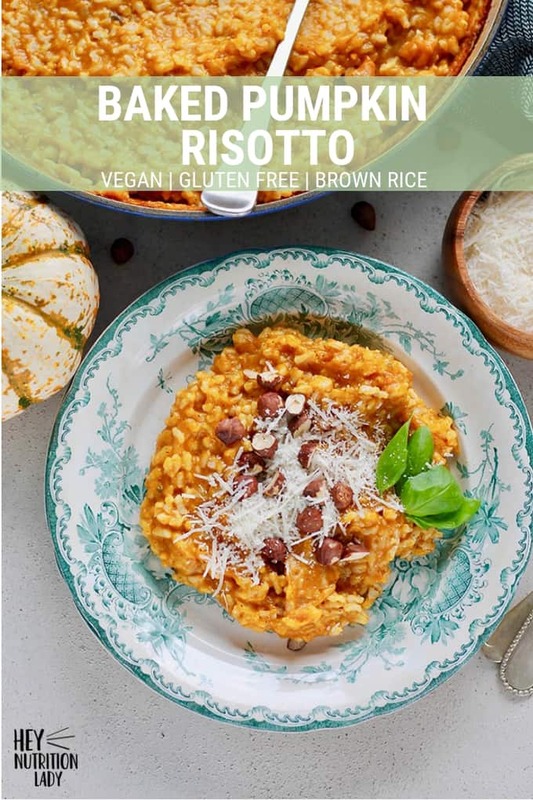 Is this baked risotto recipe vegan? You bet! I like to top mine with shredded parm because I'm not vegan, but aside from that it's plant-based AF. 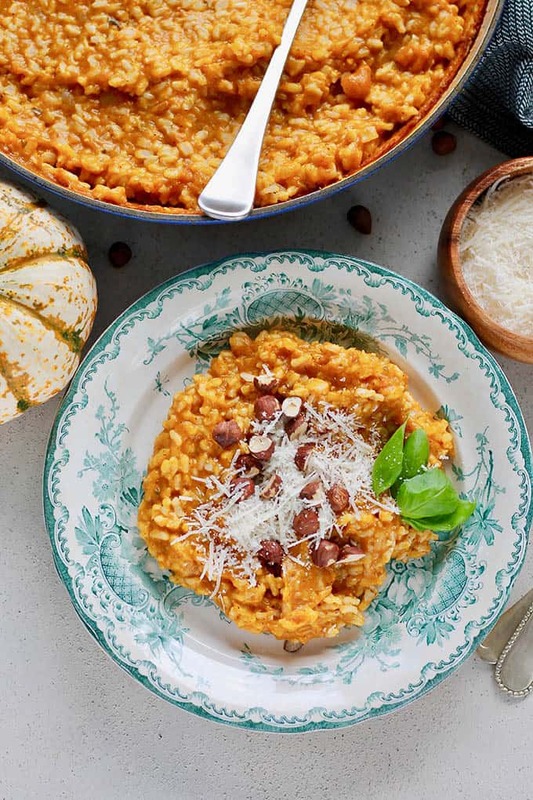 Is this pumpkin risotto recipe gluten-free? Yes ma'am. Unless you've discovered some new gluten-containing rice varietal that I'm not aware of. I baked my risotto for the prescribed amount of time and the rice is still crunchy. That happens sometimes. Just stir in a little bit of liquid - a cup or so of vegetable broth or water - cover, and bake for another 15-ish minutes. When I take the risotto out of the oven it looks super dry. Fear not! Often times a dry-looking layer forms on the top, but when you give it a stir you'll reveal the creamy goodness beneath. If not, feel free to stir in a bit of extra vegetable broth - it'll absorb into the rice as it rests. This recipe was originally published November 24, 2014. It was retested, rephotographed, and updated on October 12, 2018. This looks fantastic! 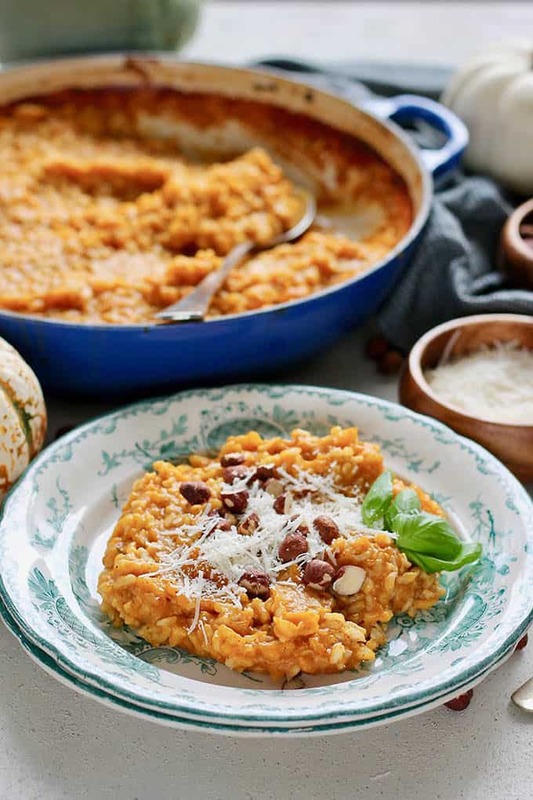 I was going planning on making pumpkin rissotto this week but had yet to finalise the exact recipe, so this was exactly what I needed! Perfect timing! It’s such an easy and nutritious dish, I hope you like it! Yeah, I have read some articles about the arsenic thing. I was going to include one in my weekly article roundup, and I still might, but I don’t want people to freak out about eating brown rice, which unfortunately contains more arsenic than white rice. I think you have to end up eating a LOT of rice for this to be a problem, so it’s mostly an issue for those eating gluten free and reaching for rice and rice products on an ongoing basis. Anyways, yes, risotto with brown rice! It’s surprisingly creamy in spite of that, and being baked. Try it! I also learned that a while ago, although it isn’t a technique I’ve tried myself, so I’m very interested to see your post! Thanks for sharing! I’ve been having a hard time saving your recipes to Pinterest! What happened to the pinterest button? Hmm, I have no idea! Do you have a pinterest button installed in your web browser? As far as I know I don’t have one integrated with my photos, but it’s possible that was done automatically when I was with wordpress.com and now that I’m self hosted it may have gone away. I’ll talk to my developer about it. Thank you Katie! I love risotto, but never have the time to make it at home. I had some leeks and thought a risotto would be the perfect dish for them. But since I recently had knee surgery I couldn’t stand at the stove for an hour. I knew there were some baked risotto recipes out there, so I did a Google search, and came across this recipe. The method is perfect, and to be able to use brown rice puts this recipe over the top! I substituted leeks for the onion, omitted the pumpkin and spices, and added spinach. It worked great and was delicious. This is my new go to risotto recipe using what ever I have on hand. Yeah, I can make risotto regularly. Sounds great, Kimberly! How much spinach did you use in place of the canned pumpkin? I hope your knee is healing well! I didn’t measure the spinach but I’d estimate about three cups, roughly chopped. I’m healing but it’s a slow process. Just have to take it one day at a time and focus on my PT exercises. Hope your summer is going well. Well this is just the perfect thing to do with that can of Libby’s I bought from the American section of the supermarket! Loooove the vermouth too, such a flavorful touch. Delicious! How many does this recipe serve? What is the size of one serving? Hey Monica! As stated in the recipe card, this recipe makes 6 servings. They’re generous adult-sized portions that would fill you up with a protein and vegetable alongside. If you need to make more or less of this recipe, you can simply change the number from 6 to whatever you need in the recipe card, and it will automatically adjust the quantities for you. I made this last night and it was revolutionary! Apart from being delish, and so seasonally spiced 👌 I loved that it was healthier for my family (with brown rice & pumpkin squash), and most of all – easy! For a busy mom of 2 it was a dream come true. Risotto, I’ve missed you so. It’s been ages since my free & single days when we danced for hours with the wooden spoon. And now your back in my busy family life – yay!! Hey Katie, I’m Chelsea! I found your website through listening to the Food Blogger Pro podcast. I’m loving your content and your recipes look incredible – can’t wait to try them out! Hi Chelsea, nice to meet you! Hey Louise! I’m go glad to hear that this risotto worked out for you. I love stove-top risotto as well, but this is just so much easier! The vermouth will serve you well! I use it in place of white wine in pretty much any recipe, and it lasts for ages.